Drama Writing MA Study and develop your writing craft, within a practical setting. 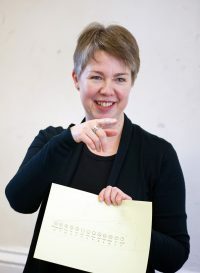 The Bristol Old Vic Theatre School MA in Drama Writing is led by renowned playwrights Stephanie Dale with David Edgar. This pioneering course aims to nurture students to find their distinctive voices as writers for stage, screen and radio. The programme is delivered through masterclasses, workshops and seminars delivered by top industry professionals and experienced practitioners. David Edgar’s plays have been presented by the National Theatre (including The Shape of the Table, Albert Speer and Playing with Fire), the Royal Shakespeare Company (including Destiny, Nicholas Nickleby, Pentecost, The Prisoner’s Dilemma, Written on the Heart and A Christmas Carol) and The Birmingham Repertory Theatre (including Mary Barnes and Arthur & George). He is the RSC’s most produced living playwright. This highly practical course is innovative in its approach by immersing future playwrights within the whole theatre and screen portfolio. By building professional assurance through artistic practice, students will develop a systematic understanding of dramatic writing as an art, craft and business. Students will have their work bought to life by working with other students studying acting, directing, production arts and stage management from across the school. The programme is delivered through masterclasses, workshops and seminars delivered by top industry professionals and experienced practitioners. This is a full-time course, but contact hours will normally be concentrated into two days a week (Thursday and Friday), with four ‘intensive weeks’ spread through the year. The Writers’ Hub is a dedicated space for teaching & learning, individual writing and for the group to programme activities. Students will gain an understanding of how directors and actors unpack text. They will also have their scripts examined in practice as actors bring their scripts to life at various points through the course. Students will have access to industry standard facilities including a dedicated writers room, a radio drama studio and film department. This course is delivered from a practitioners’ perspective and the hands-on experience will ensure an excellent start to graduates’ careers and prepare them for employment by providing a practical and critical understanding of commissioning and other industry processes. The Bristol Old Vic Theatre School has a renowned literary pedigree, and enjoys relationships with theatres across the city, south west and nationally. For instance, the School mounts productions in partnership with the Bristol Old Vic, Redgrave Theatre and Tobacco Factory, amongst others, on a regular basis, ensuring that students experience practical application of their craft in professional settings. 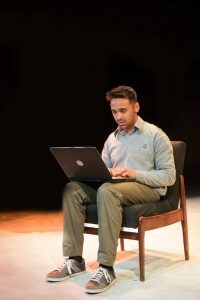 Studying and developing your craft of writing within a drama school means that you will have the opportunity to see your work practically explored by actors, directors and other theatre makers. University of the West of England (UWE). Normally, successful candidates will have a first degree. It is expected that all candidates will have some demonstrated experience of dramatic writing. Candidates would be expected to have either substantial writing experience in a non-drama medium or have been working in the drama industry and now wish to develop their writing skills. An example of drama writing will be required as part of the selection process. Applicants will be interviewed by two members of staff, including the Head of Course or Artistic Director. There may be two rounds of interviews. Coaching/teaching practice takes place either within the School in tutorial or class settings; on student productions in professional theatres; or in other professional contexts outside the School. • To nurture your distinctive voice as a writer, building your assurance through your artistic practice. • To develop your systematic understanding of dramatic writing as art, craft and business. • To enhance your core competencies in dramatic writing; understanding and confidently using key elements of (but not limited to) structure, narrative architecture, genre, character, dialogue, action and dramatic devices. • To enable you to explore the different demands of the various dramatic media (specifically stage, screen and radio/audio drama) and to practice using those skills with originality. • To develop your professional practice, enhancing your practical and critical understanding of commissioning processes. • To investigate the role of the writer within a range of models of work. E.g single-author signature script; catalyst and shaper in a devising process; team writing in serial drama (radio & TV); collaborating in teams creating musical theatre or animation. Only eight students are accepted on to the course each academic year. Students are expected to be engaged on the course for a minimum of 35 hours a week over 44 weeks; this is four terms of 11 weeks each. Contact hours will vary depending upon the module. You will be taught by an experienced Head of Course plus a teaching team whose expertise and knowledge are closely matched to the content of the modules on the course. The team includes Artistic Director (Jenny Stephens) and visiting specialist professional directors. You will be assessed on coursework, including your signature script, practical assignments, a portfolio of other work and a short business plan. The Admissions Office deals with enquiries and applications for all programmes. It is expected that by the end of the course you will have developed a signature-script to be able to offer to producers, have a developed understanding of the demands of the different media (stage, screen, audio etc) and a sophisticated understanding of the industry.